Government revenue from company tax has continued to rise during previous cuts to the company tax rate, adding to confidence that the proposed Enterprise Tax Plan will enhance our international competitiveness without risking the budget, the Australian Chamber of Commerce and Industry said today. Australia’s company tax rate has been cut by Labor and Coalition governments three times in the past three decades, and in each case the revenue collected from company tax has increased within two years. Furthermore, as the rate of company tax has fallen, the proportion of company tax as a share of total government revenue has risen. This information results from an Australian Chamber analysis of Tax Revenue data from the Australian Bureau of Statistics (ABS 5506.0). In 1988 the company tax rate was cut by Labor from 49 per cent to 39 per cent, while revenue from company tax rose from $8.6 billion in 1987-88 to $12.7 billion in 1989-90 and company tax as a share of government revenue rose from 11.4 per cent to 13.9 per cent. In 1993 the company tax rate under Labor went from 39 per cent to 33 per cent, while revenue from company tax rose from $12.9 billion in 1992-93 to $15.3 billion in 1994-95 and company tax as a share of government revenue remained steady at 14.7 per cent. In 2000 and 2001 the company tax rate under the Coalition went from 36 per cent to 34 per cent and then to 30 per cent, while revenue from company tax rose from $26.0 billion in 1999-2000 to $35.1 billion in 2002-03 and company tax as a share of government revenue rose from 17.0 per cent to 18.0 per cent. James Pearson, CEO of the Australian Chamber, said: “Some people have expressed concerns about the cost to the budget of lowering the company tax rate. This analysis demonstrates that Australia can improve its international competitiveness, without putting the budget at risk, by cutting the tax rate, as we have in the past with great success under Labor and Coalition governments. “Unlike the previous cuts, the Enterprise Tax Plan is a phased reduction in the tax rate, meaning the impact on revenue is even less likely to be disruptive. 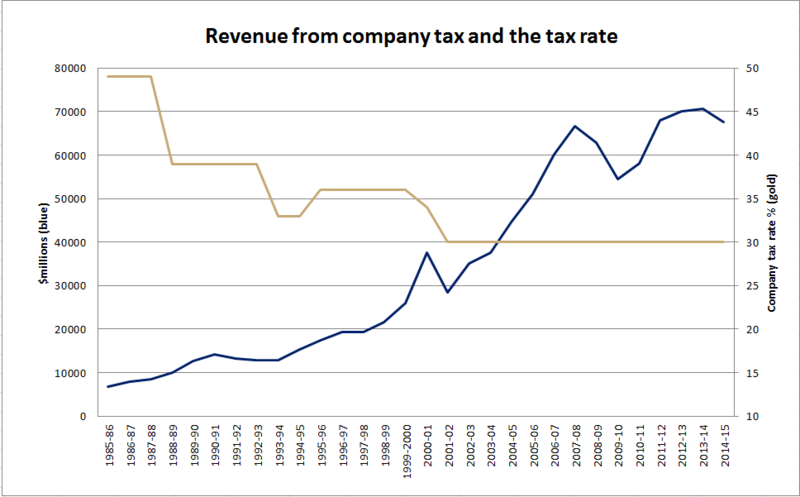 Since the rate has been static at 30 per cent the revenue share has fluctuated, demonstrating that revenue from company tax is far more dependent on creating the right conditions for companies to grow than on a high rate. “With the global movement of capital increasing exponentially, many other countries are lowering their company tax rate in an effort to attract international investment. Australia risks falling behind. In 2001 Australia’s company tax rate was the ninth lowest in the OECD, but now it stands at 31st. “The company tax rate impacts on international perceptions of doing business in Australia. What happens to our economy and jobs if investors, both Australian and international, pass us by due to the risk of low rates of return on their capital investment? “When company tax rates are lower, businesses either pay out more in dividends, which benefits superannuation funds and household investors and provide a return to capital investors, or they retain the earnings to support further borrowing or investment, which can lead to more jobs. “The Enterprise Tax Plan needs to be passed in full. Small business will benefit if all companies have a lower company tax rate. Higher wages and more jobs give consumers greater power to spend in small local businesses, while extra investment by big businesses often flows to small business suppliers. “We cannot put our head in the sand as countries compete for investment by lowering their tax rates. We risk being stuck in 2001, when we last lowered our company tax rate across the board. Statistical note: As the taxation data for a given year is updated for several years afterwards, we have used the latest data that refers to a given year. Taxation collection in 2000-2001 was affected by the change in accounting and collection of company tax which led to large fluctuations. 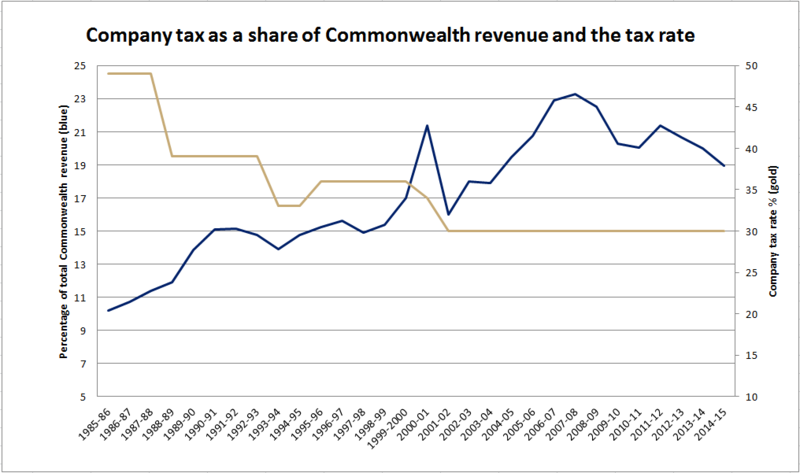 Earliest data is sourced from the ABS Yearbook summary of Commonwealth tax revenue.